How about a soothing and gently spiced soup for dinner? Our “soupe du jour” (soup of the day) is a low calorie and fat free watercress soup — perfect choice as a light meal starter or dinner if you’re planning on a treat for dessert. Watercress is part of the radish family and you will recognize that peppery flavor in this tasty soup. With the potatoes giving it a smooth texture, this watercress soup is quite satisfying. 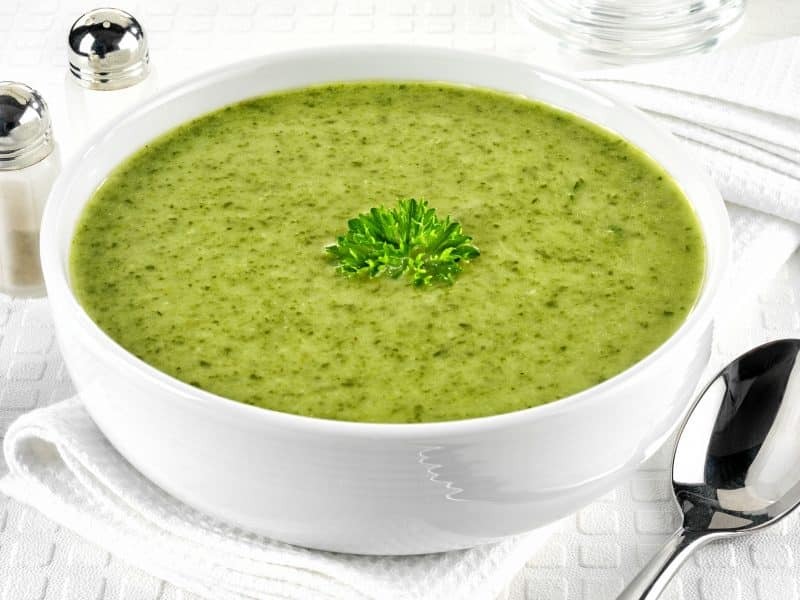 Art of the Home watercress soup recipe is loaded with the great nutrients of watercress (excellent to promote good digestion) and adding this soup before your entree will certainly help you eat slow — always a plus if you are trying to manage your weight. So check below for Art of the home detailed watercress soup recipe and Art of the Home suggestions. Simmering time is about 45 minutes but prep. time for this watercress soup recipe in less than 10 minutes so you can quickly get it going. You can also conveniently make it ahead of time — ready for you when it’s dinner time. Enjoy and bon appétit! Peel potatoes and cut in chunks. Place potatoes in a medium pot and pour chicken broth and water. Add grated garlic, salt and pepper. Bring to a boil, lower heat and simmer 3/4 covered for 30 to 45 minutes (your potatoes should be very soft and tender). Remove the larger and thicker stem of the watercress and wash.
During the last 5 minutes of cooking, put watercress in the pot. Start pureeing your soup using an immersion blender until smooth. Optional: for an even smoother soup, finish pureeing it by passing it through a food mill (we use the medium disc) — this will remove any remaining fibrous parts of the watercress. Taste and add salt & pepper if needed. Enjoy! Fat free watercress soup recipe variation: add a tablespoon of creme fraiche to add some richness and a creamy texture to your soup. Garlic lovers: sprinkle some olive oil on a piece of toasted bread and rub half of garlic clove on it. Quick and light dinner: add croutons, a yogurt for dessert, and voilà!